Take your business to the next level with this intelligent multifunction printer that scans, copies and prints CAD drawings, graphics and posters up to 24” with superior accuracy. Enjoy the convenience of large ink tanks, dual rollers, a user-friendly touch screen and cloud connection. Reduce costs lower power usage with smart management tools. With capacity to hold two media rolls, your TX 2000 MFP will quickly switch from job to job, selecting the ideal media automatically. With your TX 2000 MFP you can economically print crisp colour graphics on coated or uncoated stocks and take them anywhere, even in the rain. 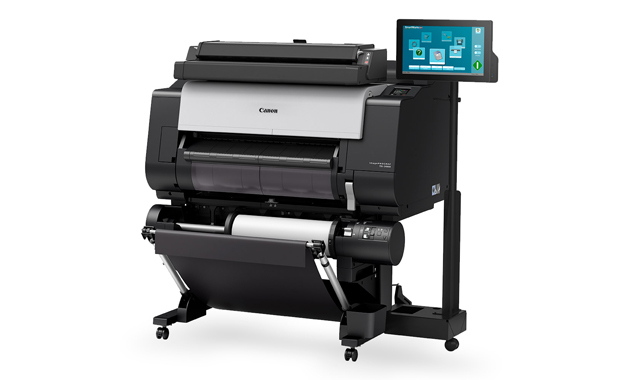 Your Canon wide format imagePROGRAF TX-2000 multifunction printer is purpose built to deliver the most professional lasting results every time. Scanning, printing, copying and saving CAD drawings, GIS and posters to the cloud is fast and simple using this automated wide format printer. With a host of management tools, you can customise operations and reduce your costs and environmental impact. Interested in the Canon iPF TX 2000 MFP? Contact us to see how this Technical Printer can help your business!